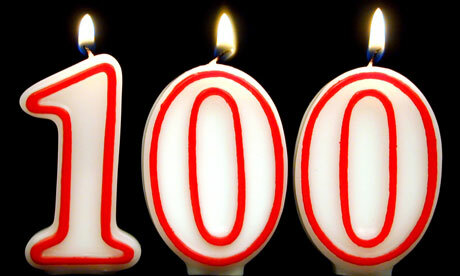 On Thursday, March 6, 2014, we’re going to be holding our 100th #EMchat session. That boggles my mind. It’s true that if you look at our calendar, it looks like this chat will be our 97th. But, it’s not. In the early days of creating transcripts for our chats, I (Alex) messed up a few times and never got them documented, and as Tim Dunning will happily comment…I then messed up the numbering. No fear. We’re not rushing things by a few weeks. 100 hours of enrollment management chats. If we did that straight through starting today (Wednesday) at 3PM, we’d finish at 7PM on Sunday. No sleep. Probably lots of good drinks. Epic professional development. I don’t think that we could have ever imagined that a six letter hashtag would create such a phenomenal community. So, thanks. In honor of our [hour] chat centennial, share your favorite past chats and topics with us. Share the connections you’ve forged through this community. Share your thoughts on #EMchat as professional development. Share whatever you want. Connections Formed: Well, this number just keeps growing. I’m so thankful to have been able to make the connections I have over the last 100 chats both online and in real life. In addition, many of the connections I’ve formed here have been integral in pushing me back into the industry (as I’m currently in the job hunt) and have provided their connections to me for guidance and leads. As far as a personal project I’m working on, #EMchat provides a pretty solid (not to mention super smart) group of people to ping my ideas off of as the product is built. Professional Development: Who would have known that a Twitter chat could transform into a fantastic, free professional development tool? But it has. I learn something new multiple times a day. Questions, resources, companies, trends. You name it and you can find it in the #EMchat feed. I look forward to blog posts from our contributors who drop serious knowledge. And, I’m proud to be a part of this community. Additional Share: I’m glad that you all now know how much I absolutely love Dogfish beers. That really means a lot to me. In seriousness, thanks a million and here’s to another 100! Come celebrate with us on Thursday at 9PM EST!